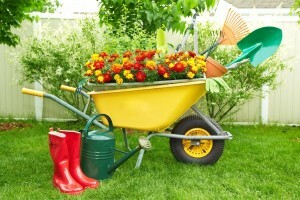 S haking off the any remaining springtime chill with a yard dumpster rental might seem unusual, but many homeowners start putting serious efforts back into their lawn work this time of year. It’s the perfect opportunity to do some maintenance, clear out unhealthy growth, and get ready for a new year of blooming, blossoming growth. But with all that dirty work comes a serious demand for cleanup. Turns out, the grass isn’t always greener on the other side. This time of year it can also range from brown to yellowing to just plain worn out. So many homeowners come out the other side of winter with an unhealthy lawn that your street may look like a barren post-apocalyptic home and garden nightmare! If this is the case for your lawn, you might need to do some serious spring yard cleanup before you can address the root of the problem. (Hint: the root of this problem actually has roots.) Fertilizing your lawn so it can return to its robust glory is a popular method for accelerating the growing process, but in order to fertilize you must first revitalize. Your spring landscape might still be cluttered with fallen branches, leaves, or shrubs that have finally seen their last days in the sun. This kind of dead weight can drag a struggling lawn down, so getting a cleanup started is very important for the healthful future of your yard. Pruning the branches of other plants while you’re at it is an important measure that will breathe new life into your landscape. March and April are good assessment months – take stock of the plants in your yard and decide which will get rolled off with the dumpster. Remember that dead and unhealthy plant life will only hold your lawn back! While you’re at it, a yard dumpster is the perfect excuse to finally take down that eyesore of a tree stump. It’s big, it’s dead, and it’s in the way. Better yet, maybe it’s time to uproot that massive unsightly hydrangea bush you never liked in the first place! Getting a professional dumpster set up for disposal can give you the freedom to tackle big projects and the security of time constraints. Rentals typically last a few days at the most, so being ambitious about your lawn care goals is guaranteed to yield results. And once the dumpster is hauled away, you’ll be left with a healthier, shapely lawn. If you are still on the fence about renting a dumpster for your yard cleanup, take a look at some of the other lawns on your street. Chances are there will be some fellow homeowners eager to get in on the action. Splitting a dumpster for a few yard cleanups you might have to splurge for a bigger containers, but the cost can be reduced in the process. Not to mention, everyone wins because they will get to look at greener, brighter, and healthier lawns this spring. Call 678-807-9328 to contact our professional team at Dumpster Rental Solutions to find out if you are in our yard dumpster rental service area.